Urban and vertical farming projects are increasingly shaping modern agriculture. For a few months now, the surrounding areas of the city of Munich' have also been seeing a regional cultivation project. 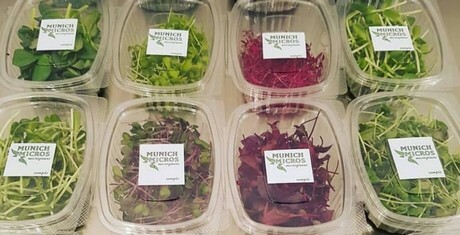 Under the name of Munich Micros, an ambitious team has been responsible for launching sustainable, regionally cultivated microgreens in 25 variations. Following its success up until now, the company has taken on the task of gradually expanding its production capacity and product range. This success story began more than 4 years ago when the founding team came across advanced vertical farming technologies in Canada and the US. The basic question at the time was: how to design a similar project in Germany, and specifically in the Munich area? "I actually tried vertical farming, or indoor farming, for the first time in our kitchen. Step by step we pushed it up to the test facility and we were then able to harvest the first products relatively quickly. After positive feedback from several star chefs, last year we moved to the current location. So we founded our company in May 2018 after nearly 3 years of development. At that time, we had a product that could compete with the world's best," says co-founder and CEO Kevin Jühlcke. At the current location, regardless of the weather, the same amounts are produced continuously. "In addition to this, we are able to offer the same quality to the market 12 months a year. With our 18 single varieties and complementary blends, we are already at 25 variations that we can offer year-round. After agreeing on the individual requirements of the restaurateurs, we also deliver exclusive varieties. Compared to the Koppert Cress catalog, we have also developed several new varieties. Including leafy mustard, a five-grade basil mix and a protein mix for vegan cuisine. The next step will be the development of sweet cress varieties. We are, for example, working on a new variety of wheatgrass with a sweet, pleasant taste." This article was a short version: Read the full interview with the producers and marketers in our April issue of Primeur.